What colour paint is used on the cabinets please? Can you tell me where the bi fold doors were sourced from please? They look perfect for my project. Hi this was natural York stone bought from a reclamation yard. patio at dpm level - You've built the patio over the dpm are you not worried about damp issues? Or have u installed some sort of drainage that I can't see on the photo? Bifold - I love th bifold doors in this picture. Where are the from? where are the table and chairs from? - where is the gorgeous table and chairs from ? I love the flagstones used here. Where did you source them from? …or keep things traditionalThis is a fabulous sunny spot for so many reasons. 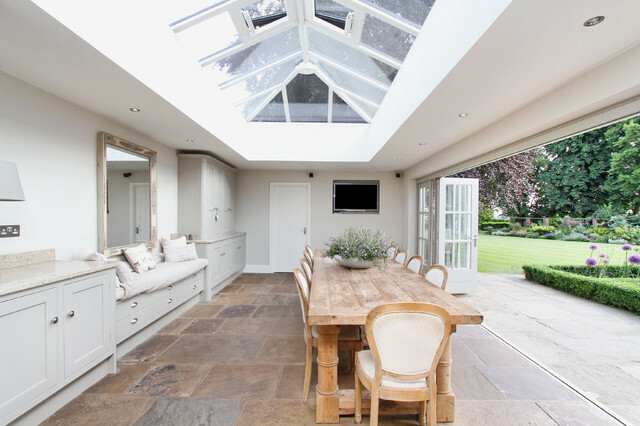 The traditional roof lantern allows natural light to drench the room, while the concertina doors fold right back for a double-hit light source.Such an effective use of glass structures demonstrates brilliantly how glass doors, ceilings and panels are not just the preserve of the modern home, but can add so much to traditional schemes, too. lantern and more traditional-looking bifold doors. This is the type of orangery look for dinning area, but with chandelier. The pantry in the back gives me ideas for mine.